The hotel was built in Szépasszonyvölgy one of the well known and most visited part of the city. The famous wine of Eger and the valley of culture attract people during the whole year who would like to enjoy the comfort of a four-star hotel, the traditional European hospitality and the personal service during their vacation or business trip. How to get to the hotel: Go along highway M3. Take the exit at Füzesabony and head towards Maklár. Continue along priority road Nr. 25 through Andornaktálya and turn left towards Szépasszonyvölgy. All of the 20 hotel rooms have a balcony and are air-conditioned. Each room is equipped with LCD TV and Internet connection (own notebook needed). Anti-allergenic bed linen and mattresses assure a pleasant relaxation. Some of the rooms have a Jacuzzi also. Our two-room suites are large enough to accommodate families. 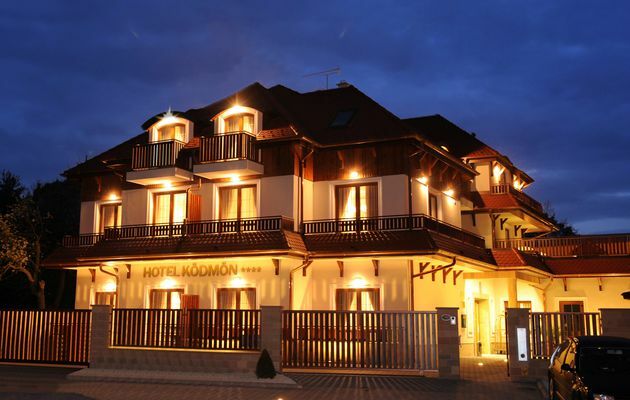 The high quality gastronomic activity of Ködmön Csárda (Ködmön Restaurant) was acknowledged by the European Catering Association. The culinary masterpieces of the head cooks, candle light, pleasant Gipsy music and the excellent wine from Eger make your dinner unforgettable. After the dinner you can taste delicious Cuban cocktails and Cuban cigars in Cafe Habana, a real Latin club. We try to make your stay memorable with ancient ritual massages, pampering luxury treatments and refreshing tea specialities. In Eger a unique bubble bath with colour therapy, various adventure elements, steam cabin with aroma therapy, Finnish sauna, vertical sunbed and free wellness shows await the guests. In summer the Jacuzzi and the vitamin bar, a glass of champagne with some pieces of strawberry can make the full moon nights memorable. Our conference room can be partitioned with a soundproof wall so we can host a business seminar and a team building at the same time. Removing the partition it can be the perfect venue of conferences and receptions. The high quality technical equipment is assured in each room. Other service: closed parking places, bicycle rental.